This piece was originally written for Wales Arts Reivew, which can be found here. This is the longer version of that piece. “History is about the crack wide open” warns the Angels to Prior Walter. 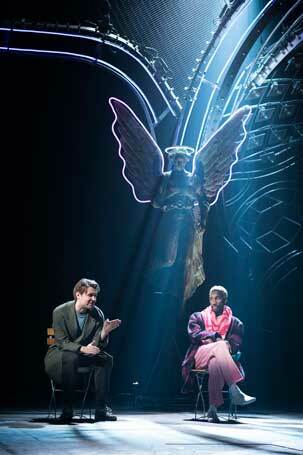 And history, of Reagan, 80s America and AIDS is certainly on show for all to see in the revival of Angels in America. But why does a play about 1980s America, specifically the title might suggest Gay America resonate still? Is it now a play that is dated? Is it a historical piece? Set in 1985 and Addressing issues- from AIDS to Cold War Politics that have now receded into the past or given way to new concerns? When viewed today parts of it seem terrifyingly current. Economic downturns? Extreme right wing political views taking hold? Fear of Russia? Vague but ever present threat of nuclear war? Impending environmental disaster? Granted, when the play was announced a year ago nobody could know we’d have an American President and British Prime Minister who genuinely longed to return to the days of Reagan and Thatcher, or that the threat of war with Russia or nuclear fear like the Cold War would enter our day to day lives again. 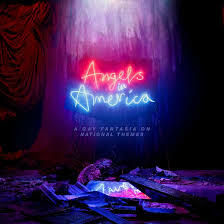 The announcement that Angels would be returning to the National Theatre in 2017 is more of a ‘homecoming’ than the subtitle ‘A Gay Fantasia on National Themes’ might suggest. The play in fact received its world premiere at premiered at the National Theatre in 1994, where by a quirk of logistical fate it opened ahead of its Broadway counterpart. It was a hit in the smaller Cottesloe space, and earned theatrical accolades on both sides of the Atlantic. One of the most important and memorable pieces of new work the National has staged, it was no surprise it was included in their 50th Anniversary celebrations, or that Rufus Norris has chosen to revisit the play in his second year in charge of the theatre. 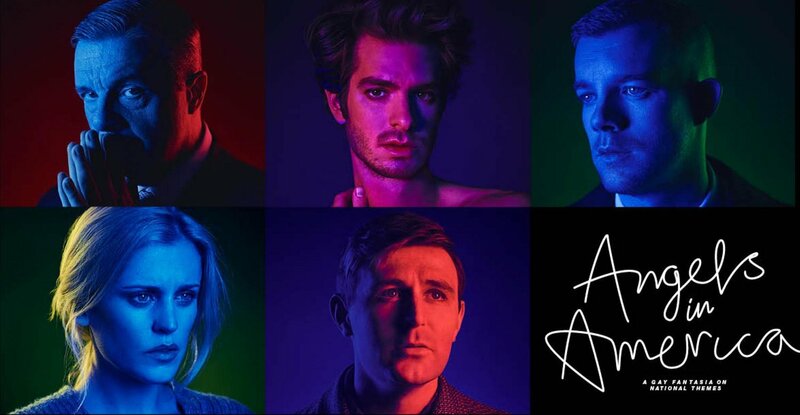 This time including a starry cast including Andrew Garfield, Nathan Lane and Russell Tovey along with Olivier award winner, and all-round star of British theatre, Denise Gough. Combined with direction from Marianne Elliot, who has delivered some of the biggest hits for the National Theatre in recent years, this is not so much a homecoming then a triumphant return that looked to defy the previous production in scope and scale. More than this however, it is a sign of the significance of the play itself, that the NT has returned to the production on such a scale. Including it in the celebration of 50 years was an indication of its importance to theatrical history. 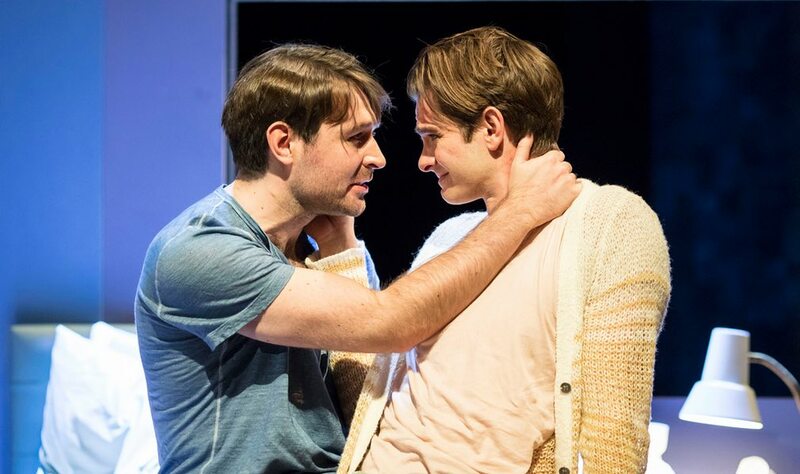 The epic two-part play, subtitled A Gay Fantasia on National Themes is described by Kushner as about ‘AIDS, America and Mormons’. This sprawling 7-hour epic takes on not just AIDS, Religion and Gay identity, but the sprawling mass of American politics and history. The play was supported by the National Endowment for the Arts which compelled him to include something about America in his play, and it is in some respects Kushner’s ‘state of the Nation address’. Meanwhile the play still finds time for an analysis of history and philosophy, coupled with often surreal and always fantastical flights into alternative realities. 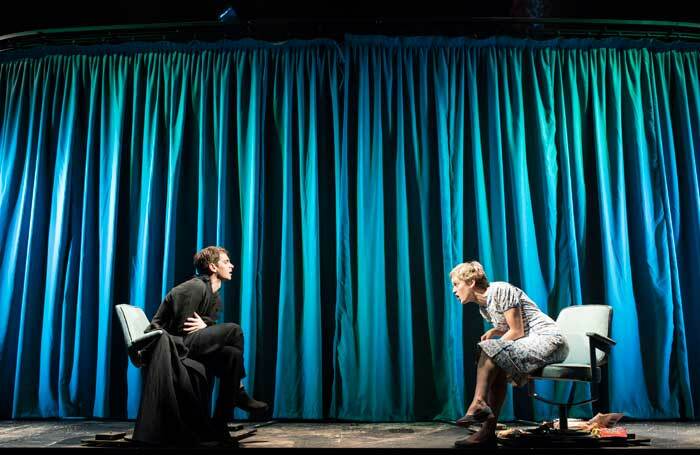 Crafted in the style of ‘Brechtian Epic’ theatre, the plays do not shy away from big set pieces and big ideas that still feel pertinent today. From Louis setting out his stall on the state of America, race and politics- and being challenged to think outside his leftist liberal bubble- today sounding like they might have been lifted from a well-meaning but misguide blog post and resulting comments section. Meanwhile Kushner uses the embodiment of real-life figures Roy Cohn and Ethel Rosenberg, to look back on American history as well as the limits of forgiveness and tolerance in us as people. All while also having the audacity to appear to answer the question of what is Heaven? And indeed, who is God? It is grand, far reaching and bold. And it more than stands up as a play as director Marianne Elliot gives it not just ‘more life’ as Prior asks but new life, and does what every good revival should- challenge the very material itself. 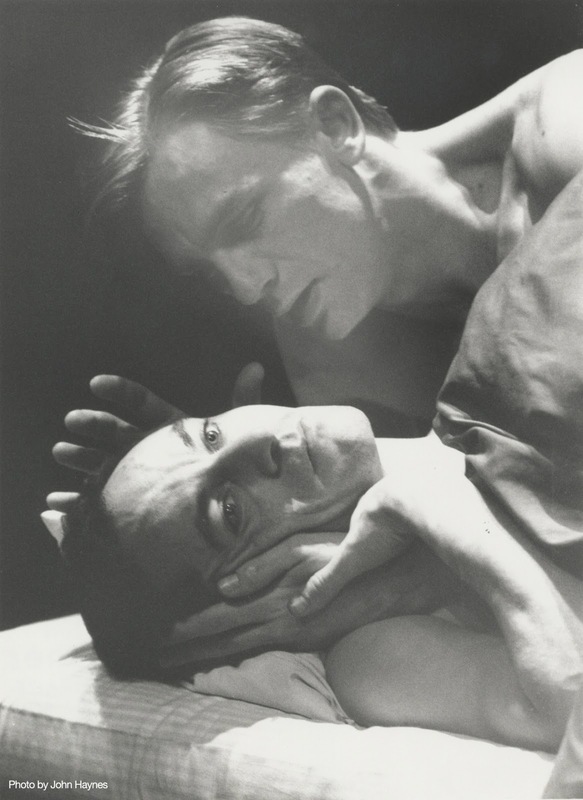 Divided into Millennium Approaches and Perestroika, the play follows Prior Walter, gay man, and newly diagnosed with AIDS, and his boyfriend Louis. Parallel to them, Joe Pitt and his wife Harper struggle with their own relationship issues and Harper’s Valium addiction. Meanwhile Joe, a Clerk of the Chief Justice, is being courted by Roy Cohn, based on the real-life lawyer who worked for McCarthy and Trump, and died of AIDS denying his sexuality to the end. Roy and Joe’s father/son relationship, with undertones of both the sexual and sinister confuses the already conflicted Joe further, as does his encounters with Louis. As part 1 catapults towards conclusion in this fast-paced production, Louis has left Prior and convinces Joe to give in to his impulses and come home with him, while Harper wanders lost in the park and in her delusions. Prior, left alone has had visions, which come to a head in as he says, Spielbergian style with an Angelic visitation. Kushner’s was one of a wide variety of theatrical works to tackle AIDS, but also the highest profile. 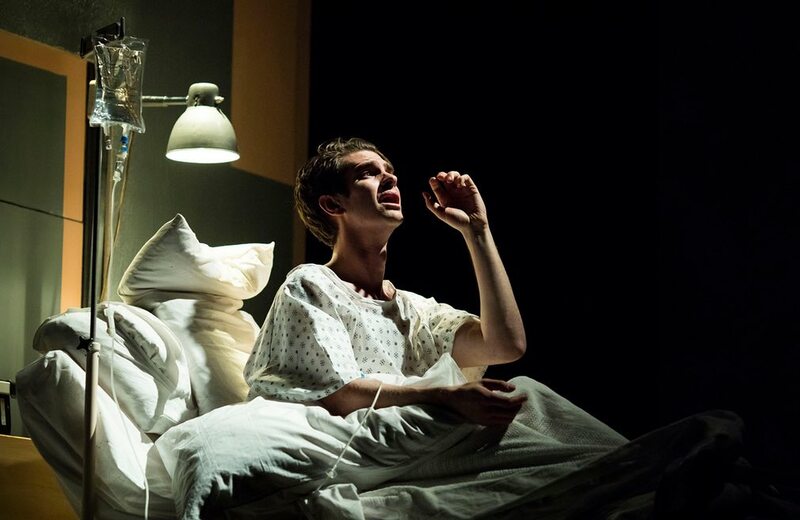 His depiction of AIDS in the earliest years of the epidemic is brutal in both its depiction of characters succumbing to illness, but also in the treatment of the wider impact on the lives of those affected by AIDS in the broader sense. He also addresses issues of what it meant to be a gay man in the 1980s across the spectrum; from Louis and Prior’s unapologetic openness to his closeted characters, Joe and Roy. Charm and humour come to Lane easily, and his early scenes and the bullish Cohn at the top of his game are delivered with the kind of impeccable comic timing you’d expect. However, beneath the surface there’s a darkness that is terrifying even in these moments, it’s a balance that Lane wears well in Millennium and by the time he is seen suffering and dying in Perestroika his darkness as a character is clear. Which balances well when, as the audience sees him succumb to the effects of AIDS we ask how we divide our sympathy differently for this truly unsympathetic character. Lane confronted with the challenge of playing the devil of the piece but also in winning an audience over as ultimately Roy’s character becomes a lesson in forgiveness- as Belize says, ‘A Queen can forgive her vanquished foe’ Elsewhere, with Joe Kushner gives us the young man finally coming to terms with his sexuality, but ultimately the sympathies here lean towards his wife Harper. 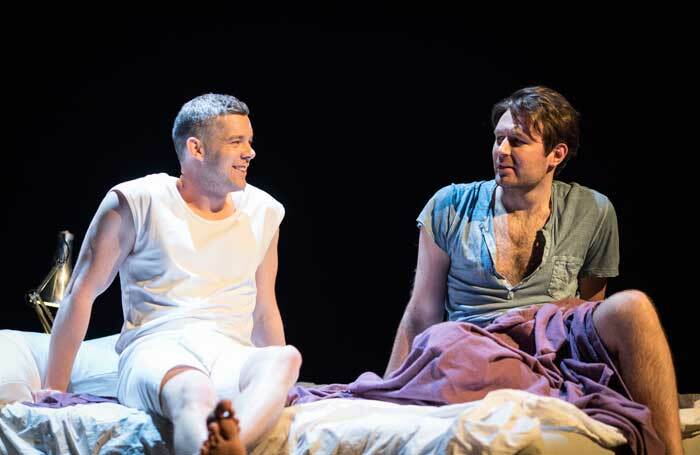 Denise Gough never plays Harper as weak, or a victim, and sometimes sympathies shift to Joe a puppy-like Russell Tovey, battling his own demons of sexuality while trying to still be a good man and ultimately good husband. Millennium is a naturalistic affair, and is staged as such-often with jarring realism as Roy and Prior succumb to their illness. The stage consists of three main revolves, which at the start separate out into Louis and Prior’s areas, Joe and Harper’s with some no man’s land between. 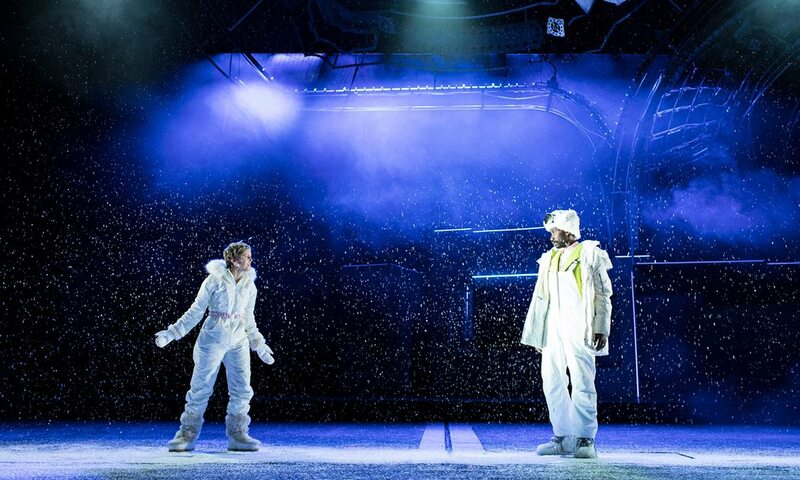 As the play progresses, the set is used cleverly to literally ‘revolve’ them into each other’s worlds, until by the split scene towards the end of Act 3, they have completely bled into each other, and their spaces. A neat parallel to the staging of this scene also returns at the end of Part 2. The simplistic backdrops offer a variety of rooms that adapt to the range of settings across the play- from apartments to park benches, diners and City Hall. A clue to the scale of Part 2 however is a moment when an entire apartment (Roy’s) emerges from the floor, and the metaphor of Roy emerging- and returning- bellow may not be intentional but is apt. The real heart of the piece, and the real challenge to the audience lies Prior, the insight into Kushner’s philosophical reflections yes, but also the heart of the paly as the man we watch succumbing to AIDS. The effect of this hinges largely on the performances of Andrew Garfield as Prior and James McArdle as Louis. Garfield quickly proves he is a natural Prior, balancing heart-breaking performance with a razor-sharp wit. McArdle’s understated but powerful performance as Louis is what really lifts this element of the narrative and the heart of the play however. as his struggling partner, Louis- in this scene beyond is increasingly he is a tough character to love, but making the audience understand him adds strength to the conflicted narrative about love and loyalty that Kushner creates. Much of the story hinges on Prior being abandoned by Louis because of his having AIDS, a brave bold choice in Kushner’s writing at any time, but particularly in 1995 when the gay community was still being decimated by AIDS. There is naturally a drive to depict those in the community as wholly good a caring and point the finger only at government, at homophobia, and pharmaceuticals. However in reality many people struggled with their new-found roles as carers, and whether AIDS or any other illness it’s an honest and difficult question to ask, ‘could I cope?’ and a brave narrative choice to have the answer be ‘no’ because the audience still has sympathy for Louis as the one who walks away, because ultimately, we understand him. And because, despite the subtitle A Gay Fantasia on National Themes what Kushner’s play is, and why it stands up 25 years on is that it’s a play about people in all their complexities. 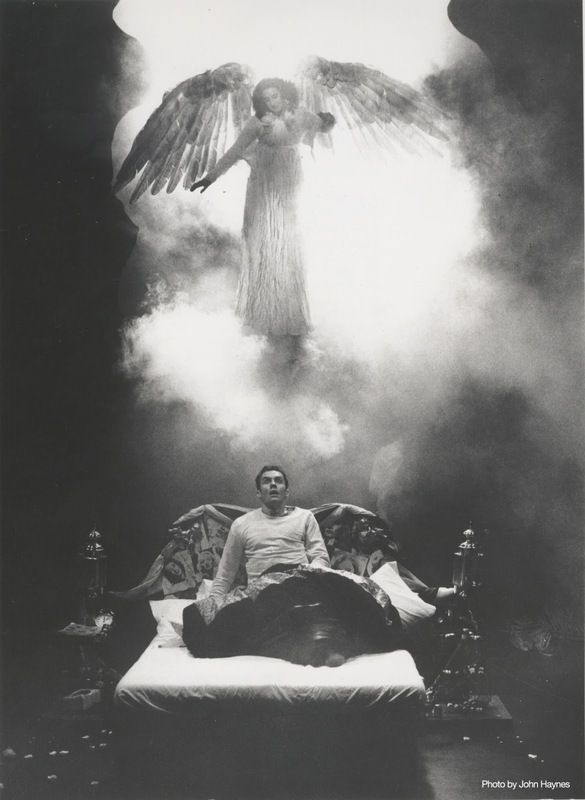 Angels is both one play in two parts and two separate plays, and though both are written in the Brechtian Epic style it is Perestroika in which Elliot truly runs with this style. Millennium’s at times overly-staged format becomes instead a set up for the stripping back, and (almost literal) pulling the rug away from the audience in Part 2 until they are left with a virtually bare stage. This is by no means a simplistic staging and things veer from a piling up of debris on stage, to spectacular intricate moving set pieces, to of course the returning Angel of the title. The arrival of the Angel, steers Millennium into Part 2, Perestroika a sign of a shift in the world of the play, and the theatricality used to get there. And The daring approach Elliot has taken to staging the Angel, possibly the most difficult question in staging this piece, shows the confidence of a director at the top of her game- the audience thinks they know that Angel. The image of her crashing through the ceiling is probably one of the most famous from the original, and every production since. ‘Very Steven Spielberg’ Prior says just before she arrives, except if it happens as we’d expect, it isn’t. And Elliot knows that. What she delivers instead was jaw-droppingly clever, not just for that one ‘wow’ moment but in how we see the Angel, and indeed who the Angel is for the rest of the play. It’s both clever and terrifying and a perfect insight into Prior’s psyche as he encounters this spectral beast. It’s also in theatrical terms exactly what a big revival like this should do- reinvent, reimagine and give audiences something new. Naturally many an audience at the National will hate it, but it’s entirely possible that was the point. Perestroika is a theatrical piece, reliant on a director teasing out all the elements that lift it out of what can simply end up a wordy confusing mess without the right steer. Which Elliot manages admirably, particularly when viewed alongside Millennium. Although theatricality drives Perestroika it is not without its moments of honest emotional realism, and that is the gift that is this piece a challenging but rewarding veering between the two pulling the audience along with it. It’s a confidence of a director to take things this far, but also an acknowledgement that audiences are intelligent, and will engage if you deliver. There is also a confidence present in knowing when to return to the words of the playwright, and trust in the power of the actors. And it is with this the play ends. Stripped back staging as part of the wider metaphor yes, but also offer no distraction from the writing. As set and Angels come and go, and as things within the narrative seem to spiral more and more out of control and into the realm of the supernatural, the stage becomes barer. Subtly the workings of the production are more on show, until, mirroring Kushner’s stage directions for the Angel herself, literal ‘wires show’. Last of all left in all this, is the grey metallic structure that has hung in semi-darkness throughout. And while everything else is stripped to bare stage in theatrical-meta moments, the grey structure remains; it becomes the structure of heaven, which of course has watched over the production, but not illuminated, not interfering, exactly as the Angels of the piece do. In doing a final battle with the Angel, Prior is released after demanding ‘More Life’ What that ‘More Life’ might mean is ultimately in the hands of the audience, and 25 years after the original naturally some of that meaning, and what is carried out may have changed. It was never about the specifics of the politics for Kushner- he was writing back to the Reagan era as Clinton was elected president. The play looks back on American history, on human history to ask how we might progress. As the Angels fly once again to London’s South Bank, it’s also a fitting reflection on theatrical history, and this production, on the art of theatrical progress. 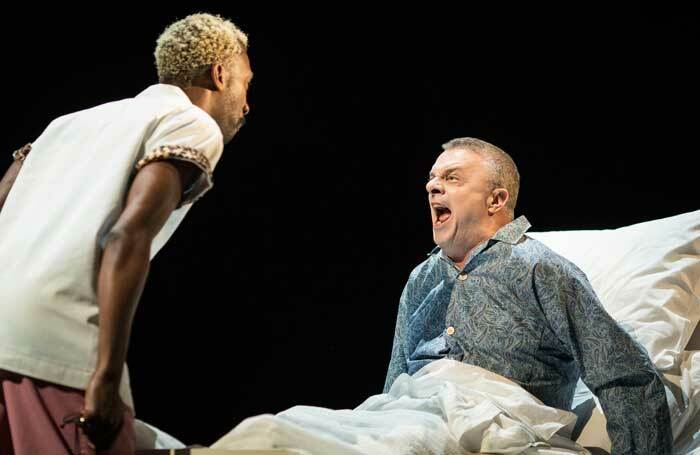 This play was an important landmark in the National Theatre’s history- situating not only an American play, but an American gay play about AIDS on the national stage (in both senses) was a brave and important move. And reviving it remains just as significant. It is still a ‘gay’ story that needs to be heard amid continued homophobia, it’s a story about AIDS and commemorating those lost but remembering the epidemic goes on, albeit in a different way. But is also still a play that speaks very much to our current times, and to humanity. More however than a place in theatrical history, this now historical piece has themes which resonate strongly in the contemporary setting. We have only to hear Louis say ‘You’re scared. So am I. Everyone is in the land of the free. God help us all.’ Or hear Joe’s almost blind defence of his voting choice ‘Ronald Reagan is a good man’ to feel we know these characters in our present time still. 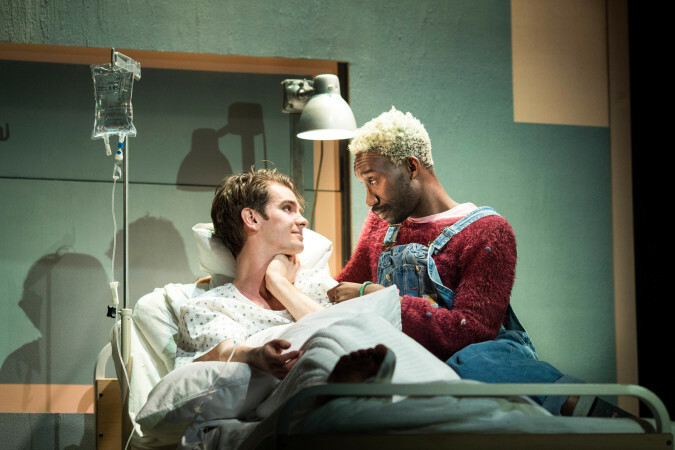 And, any question of whether the politics apply only to an American audience are surely silenced when Nathan Stewart Jarret stops the show with the applause following his “There’s a nursing shortage, I’m in a Union, I’m real scared” proving that the play evolves to fit the current times also. Elsewhere, the sentiments on race in America feel shockingly current, and though holes in the ozone layer no longer threaten, the themes of environmental apocalypse still resonate. It may now be 17 years since the new Millennium, not 15 before as in the play, but the world of Kushner’ America, and indeed the world, is familiar.